Generational differences matter in the workplace, and “style flexing” can help. In Pearl’s January 2015 article called “Imagineering 2015: Intricacies of Style Flexing,” she talks about the growing need to address generational dynamics in the workplace. Her term “style flexing” means being able to adjust your personality style in order to interact with others. This could mean making changes to your managerial style or your communication style, all with the goal of better meeting the needs of generations different from your own. The article determines that learning what motivates others and how their triggers might be different from your own is the key to bridging the generation gap at work. We agree with Pearl that the growing generational diversity in the workplace is an issue that needs to be addressed, and being able to “flex” your personality style to meet diverse generational needs is the best possible strategy for success. One way to be able to address this issue is with DISC. DISC teaches strategies for being able to manage people with different personality styles and can provide training on how to work with people from different age groups with very different personalities and needs. “Style flexing” can be a great concept to introduce into the workplace through DISC, as it reminds everyone to think outside their own perspective and make smart decisions based on how to best motivate others and get the job done. 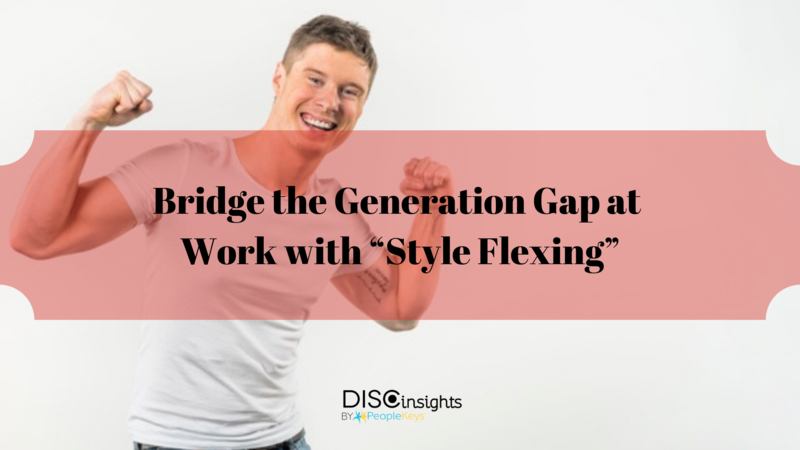 "Style flexing" through DISC will help employees learn to engage with their coworkers, especially those of different generations. When “style flexing,” this would mean you would need to adapt to adjust to these traits, fine-tuning your approach (and expectations) based on your understanding of the workplace personality style of Millennials. If you are a Millennial, especially one in a managerial position, this would mean recognizing your strengths and “flexing” to compensate for any potential shortcomings, especially ones that would interfere with motivating staff. The take-away, though, is that based on shared generational personality traits, it’s very likely that the workplace will see more style differences and personality clashes arise among its employees, given the diverse generational mix in the office. Boomers, Gen X-ers, and Millennials will all be working in the same office, and we need to find strategies to communicate better, work together, and appreciate one another’s strengths.